Celia loves sleepovers at Nonna’s house. Nonna roasts and bakes. The kitchen fills with delicious smells that tickle Celia’s nose. ‘How’s my little angel/” Nonna whispers in Celia’s ear. Celia tugs open her special cupboard. It is full of secrets. Jigsaw puzzles, colouring books and felts – all her favourite things. Celia loves to visit her grandmother, Nonna. Together they cook and play, draw and share stories. But Nonna is becoming forgetful. Each forgetting is small, but together they mean that it’s not safe for her to live alone anymore. So Nonna is moving to a new home, a single room. There is only just room for Nonna, no space for Celia to stay and very little that is familiar. It doesn’t smell right either, no cooking smells, no smells that belong to Nonna’s house. Celia begins to draw the things she loved about Nonna’s house, beginning with the outside. Picture by picture, Celia adds to the collection for Nonna’s wall. Nonna loves Celia’s pictures and Celia loves that she can still share time with Nonna. Illustrations are full page in warm colours and depict the loving relationship between Celia and her grandmother. The font has been particularly chosen to assist readers with dyslexia. It can be difficult to understand why life has to change, when a loved grandparent can no longer live in their home. Celia and Nonna suggests that a relationship is more than walls and windows, more than just the place where the memories are set. With help, new memories can be created, memories that build on what was and give meaning to new circumstances. Many young readers will relate to the closeness that a child can share with a grandparent and will rejoice that Celia finds a way to enjoy and decorate Nonna’s new home. It also demonstrates that a child can have an active role in establishing belonging in a new place. 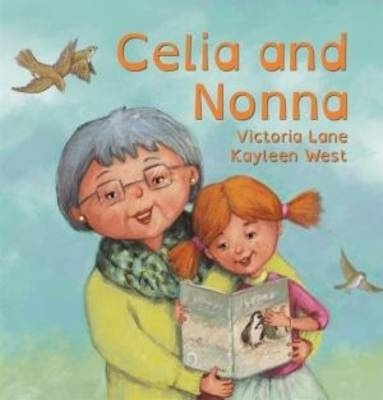 Celia and Nonna may also help young children understand changes that they are experiencing in their own family. Recommended for pre- and early-schoolers.